Wrote 7877 words in "Perfect Love"
"Miriam's Secret" had an interesting principle to it. Miriam has been the caretaker for Englisha man, Mr. Brand. When he dies, he leaves his farm to Miriam in his will--free and clear. Her family has always scrapped by financially and her daett warns about the hold money has over you. What will Miriam do when it appears the guy he has liked for long time suddenly seems interested. How will she trust he isn't only after the farm? "Miriam's Secret" didn't flow very smoothly when I read it. It made me think of riding on a dirt road on a summer day after the rain. I'm not 100% sure exactly why it felt jerky. The way it was written was like older books used to be. It used a lot of "tags" over "beats" . So it had quite a few sentences like this: "Thank you," Miriam said nervously. or "I've also written this down so you can refer to it if you need to," he said. Maybe being a writer myself and reading up on the subject has "tainted" my view of the book. They encourage authors to use "beats" which show who is doing the speaking by showing the actions they are doing instead of just saying "so and so said". Another thing that is a big deal for writers is "Show don't tell". Show the emotions instead of just telling the emotion. This book had some "telling" as in this sentence: Rose bowed her head for a short prayer, and Miriam felt relief. The book also seemed to rehash the same things over. The topics of Miriam keeping her money a secret and her doubts about if men were interested in the money or her, Shirley pinning over Jonas Beachy, and how evil money was, were repeated multiple times. There were some formatting issues that I'm assuming will be fixed in the book once it is published as I had an advance reader copy. There were a few other errors of small words like "or" and "was" being left out and Jonas was called Jason one time. In another spot, it said, "Betty...she's Mahlon's brother." The story wasn't horrid, but it wasn't spectacular, either. The book seems to abruptly end. Miriam gets engaged and then the book ends. It doesn't resolve what Shirley is going to do about Jonas or what Miriam is going to do about the money. I know that there are two more books coming in this series, but I'm not used to books in a series leaving things unfinished. The series I've read before wrap up that book's storyline and subplots and sometimes give a little glimpse into what the next book is going to be right at the end. I feel neutral about a recommendation. I wouldn't push it, or say not to read it if you wanted. I received a free digital advance reader copy through netgalley in order for me to review this book. All opinions are my own. Anna Helmuth is up to her matchmaking ways again in "Huckleberry Spring". This time, she lures their grandson Ben Helmuth back from Florida so he can help on Huckleberry Hill while Felty has surgery. She talks Emma Nelson into helping her to grow a giant pumpkin in the hopes that Ben and Emma will rekindle their romance. Ben had abruptly called off their engagement 8 months ago and moved away. Emma is sure that her propensity for accidents is what drove Ben away, but Ben doesn't want to burden Emma with his secret, so they suffer heartache in silence. Can they realize God's plan for their lives isn't always pretty, but to trust Him anyway? 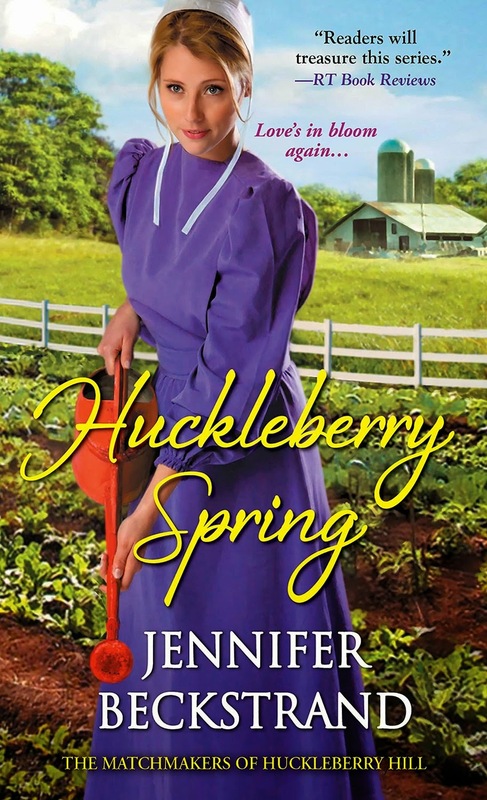 "Huckleberry Spring" is the fourth in the "Matchmakers of Huckleberry Hill" series. I have read all but the very first in the series, as well as a novella ("Huckleberry Christmas"). Like the other books that I've read by Jennifer Beckstrand, I enjoyed reading this book as well. It was a mystery to me why Ben kept saying he wasn't deserving of Emma's love until the pieces fell into place. And even then, I guessed wrong! I loved Emma and Ben and Mahlon and Lizzie and of course Anna and Felty. I enjoyed the subplot story as well (which I did guess correctly) I am glad that Ben grew in his walk with God and accepted His will for his life even if it wasn't easy. I am glad that Emma realized she was strong and not just prone to accidents. I would recommend this book to those who like Inspirational Amish Romances. I received a free eBook Advance Readers Copy from Kensington Books through netgalley in exchange for my honest review. All opinions are my own. Chef Lindsey Solberg moved back to Riverbend to help care for her little sister after their mother's death. She has agreed to cater the teens' Valentine's Day fundraiser when she realizes that the youth pastor is none other than her high school crush, Nick Harrison-the man who trampled her heart. Nick wants a chance to show Lindsey that he isn't the same selfish boy he used to be, but Lindsey has shut him out. He has no other option than to send her gifts letting her know he is "secretly yours". I loved "Secretly Yours". Lindsey's reaction to seeing Nick again is totally believable and Nick is the kind of guy you want to be your secret admirer. I enjoyed watching the characters grow in their relationship with God. Valerie has done a great job incorporating the gospel message into the story and tying the kind of love God has for us to the love a man has for a woman. "Secretly Yours" is a quick read, but it doesn't feel like you are missing out on any of the story. The characters and settings are fleshed out and complete. I also have to say, I like the idea of the "L" and "N" magnets for beginning drivers in British Columbia! This is the first book I've read by Valerie Comer, but it will definitely not be my last one! I would highly recommend this story to others who enjoy Christian Romances. 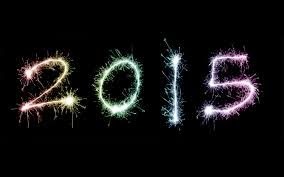 "Secretly Yours" is available for Kindle on February 1, 2015. I was given a free ebook of this book by the author in order for me to review it. A positive review was not required and all opinions are my own. 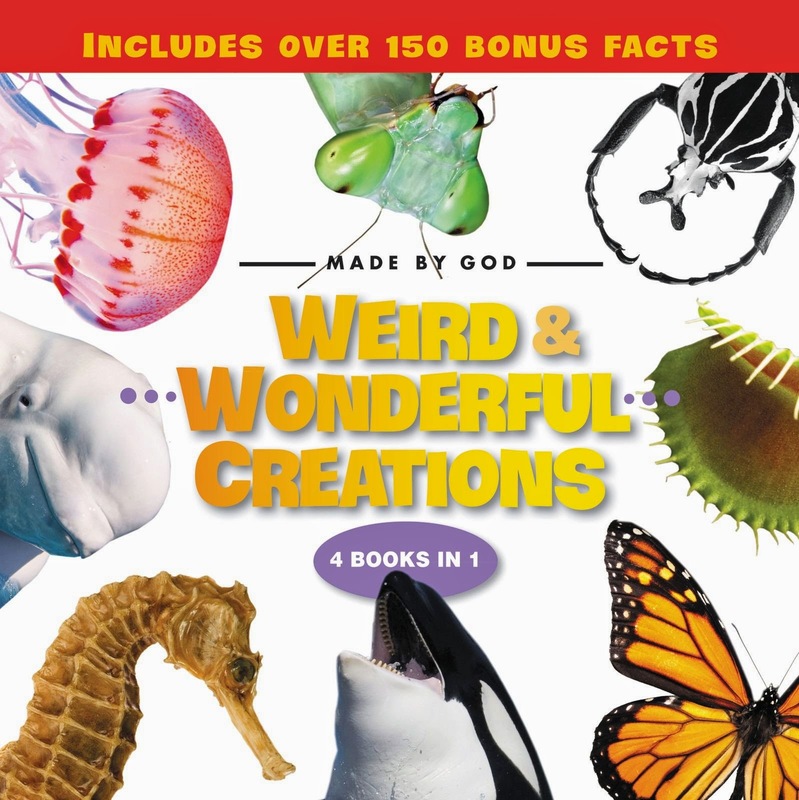 Book Review: "Weird & Wonderful Creations"
"Weird & Wonderful Creations" contains four books in one. I read this book with my children at bedtimes. We enjoyed the big colorful pictures and interesting facts about the animals and plants in the book. We learned quite a few new things. I appreciated that this book is written from a Christian worldview and talks about God creating the animals. It was refreshing to not have to constantly correct what the book was saying (ie about evolution and etc.) The book has the main text of the original book, but also little boxes with facts about the animal or plant along the edges of the pages. It is very good at keeping young readers' attention. The reading level is listed as "Reading with Help" and the back cover states "CCSS.ELA-Literacy. Rl.2.1-2.10"
I would definitely recommend this book to those with young readers. I received a free hardcover of "Weird & Wonderful Creations" from ZonderKidz in exchange for my honest review. 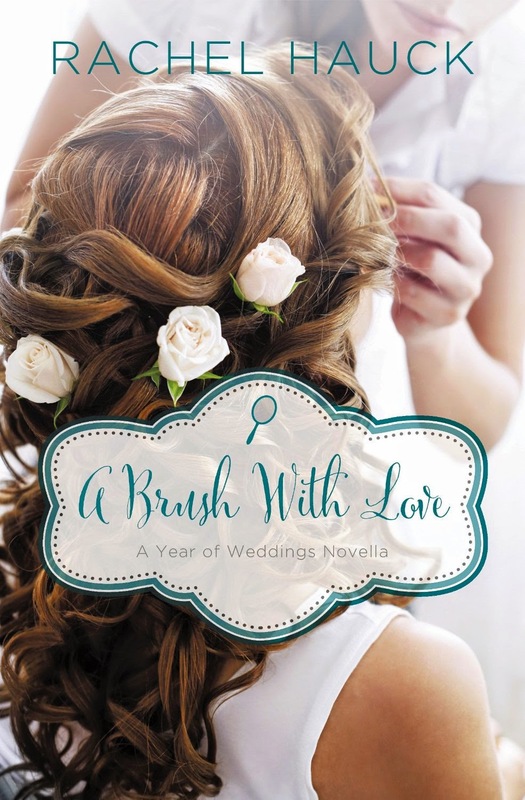 "A Brush with Love" By Rachel Hauck is the 2nd in the new "A Year Of Weddings Novella" series. This year's novellas have the theme of the heroine being involved in helping plan/orchestrate/work at other people's weddings and now they finally get their own happily ever after. Ginger Winters has a gift for doing hair. She has just returned to her hometown after touring with a famous singer. The last person she expects to walk into her beauty salon is Tom Wells Jr. In high school, he was the only one who seemed to notice her and not think of her as the freak girl. But he stood her up for a date and disappeared in the middle of the night. Tom Wells is back in town to start a church. He has never gotten over Ginger and wants her to realize she is beautiful despite her scars. But he has secrets about why his family fled that could be devastating to Ginger. Can he get her to realize that God loves her no matter what and that she truly is beautiful? Ginger is flawed, both physically and emotionally by things that happened in her past. She is easy to relate to because we all have gone through difficulties that have molded who we have become. I liked Tom. He was respectful and tender towards Ginger, but also knew that above all, she needed God before there could be anything between them. I enjoyed following Tom and Ginger as they wound their way through the hardships. I liked that they grew and changed through it all. "A Brush with Love" kept me up way too late reading because I didn't want to put it down. I'm sure other people who enjoy Inspirational Romance will also like this book. I received a free eBook of "A Brush With Love" from booklookbloggers in exchange for my honest review. The opinions are my own and I received no other compensation. "A Woodland Miracle" by Ruth Reid was a book I didn't want to put down. Ben Eicher has disappointed his father for the last time and he sends him from Florida to the lumbercamp in Michigan. The first person he meets when he gets there is Grace Wagler. She gets the wrong impression of him right from the beginning. Why is he so concerned with getting her to see the truth? Grace doesn't need another relationship that is only based on pity for her disability, so she locks up her heart and gives Ben the cold shoulder. When things around the community start going missing and then Grace herself is put in grave danger, will Ben be able to face his past to move on and will Grace be able to accept the future in order to truly live in the present? I got caught up in the book. I felt transported into the story. The characters were real people with real issues to deal with. I liked Ben. He had the bad boy image, but at heart, he just wanted to help. I liked that he grew through the story and wasn't the same as when the story started. Besides the romance aspect of the story, there is also the suspense and adventure of what was going to happen to Grace and if Ben would be able to help her in time. Being from Michigan helped me to understand the setting on an intimate level! 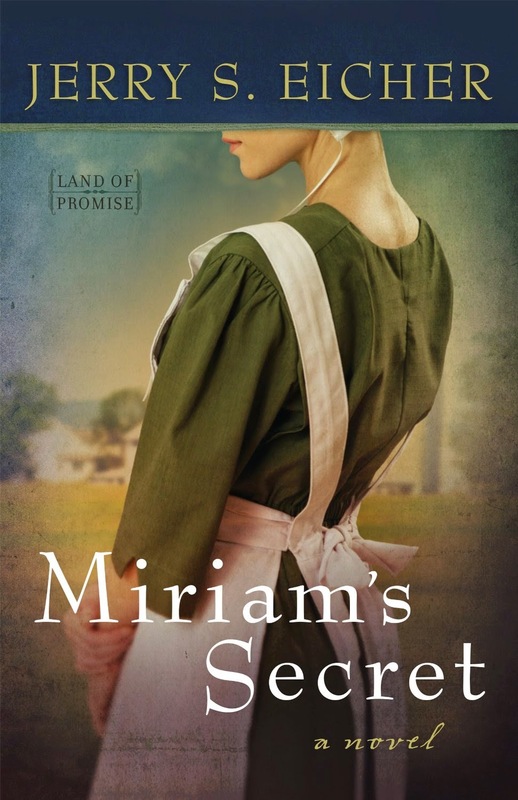 I would definitely recommend this book to anyone who loves a clean Christian romance, especially if they like Amish stories. 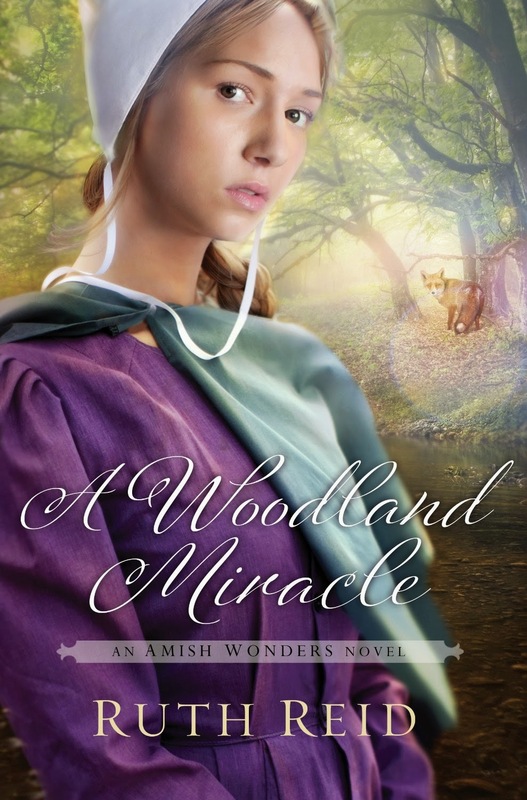 I received a free ebook copy of "A Woodland Miracle" from booklookbloggers in exchange for my review. The opinions are my own and I received no other compensation. 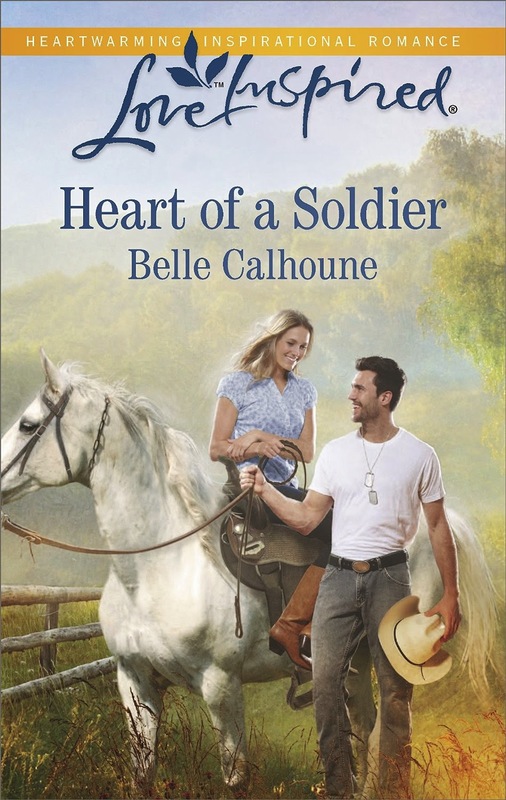 I won a paperback copy of "Heart of a Soldier" during the "Love Brings You Home Launch Party" on Facebook. Belle Calhoune sent me a signed copy. After his discharge from the army, Dylan Hart heads to West Falls, Texas to meet his pen pal, Holly Lynch. When he arrives, he discovers that Holly has neglected to tell him a very big part of her life. Dylan had a difficult childhood and it has caused him to pack up and run whenever things get difficult. He's unable to leave West Falls, however, as he has already paid for a four month lease. While there, he is hired to work at Holly's family ranch. Will they be able to get back to the special relationship they shared through their letters and will they find healing in their own hearts for their pasts? Belle Calhoune created characters who could be your friends, who had realistic feelings and responses to things. They have flaws and failures that you can related to. While I haven't personally dealt with any of the issues that Holly and Dylan had faced, I could sympathize with them and feel their struggles. There was one spot that made me pause and caused a small hiccup in my reading. On page 135 when Dylan sees Holly and her mom together "he didn't know if he was imagining it or not, but there seemed to be a slight tension between Holly and Maggie. " It seems that he would have understood what caused the tension since Holly had said they were "going through a rough patch" on page 122. But it wasn't enough for me to dislike the book or not want to read it. I would recommend this book to those who enjoy reading Contemporary Inspirational Romances. 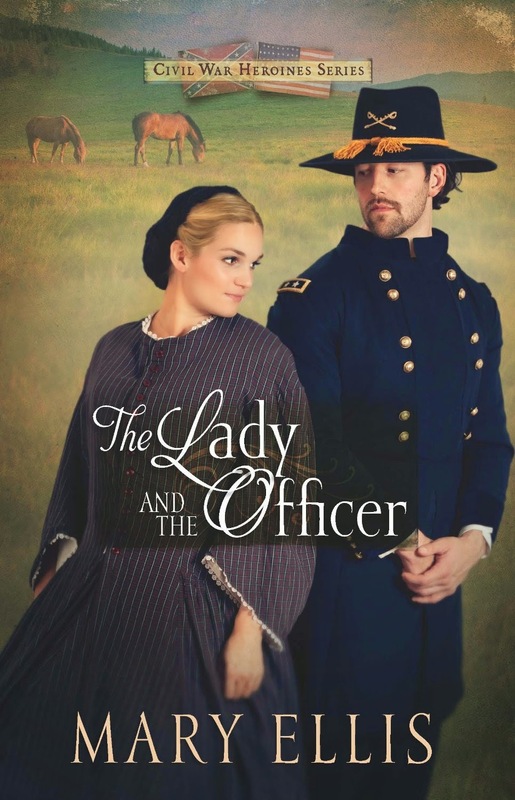 I received a free digital advance reader copy of "The Lady and the Officer" by Mary Ellis from netgalley in order for me to give my honest review. I had requested "The Lady and the Officer" because I thought it sounded like I'd enjoy reading it, but it sat languishing on my tablet waiting for me to read it as other books came and went. I'm not sure why I didn't read it sooner. Once I did finally start to read it, I didn't want to put it down! Madeline Howard lives outside Gettysburg trying to keep her late husband's horse breeding farm going when the War Between the States lands in her backyard, literally. She has already lost her husband to the cause, so when she looses everything else, she goes to stay with the only family she has left. The problem with that is that they live in Richmond, Virginia, the very heart of the Confederacy. Her uncle even works for President Davis. Madeline wasn't in Richmond long before she catches the eye of Confederate Colonel Elliot Hayward. Madeline likes Elliot, but a couple of chance encounters in Pennsylvania have left her heart belonging to Union General James Downing. When Madeline overhears some information about the Confederate Army's plans, what will she do with her new knowledge? Mary Ellis has written characters that are true to life and believable. There are twists and turns in the story to keep you in suspense as to what is going to happen next. I do Civil War reenacting, so the Civil War history involved in the book was very interesting. The characters weren't just static throughout the story, but grew and matured. I wasn't sure if Madeline and James would get their happily ever after and I felt sorry for Colonel Hayward and wished that Ms. Ellis would have shared what came of him after the war. I would recommend this book to those who enjoy historical romances with suspense thrown in. 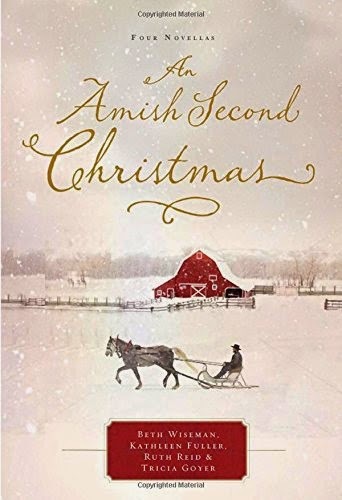 "An Amish Second Christmas" is a compilation of four novellas. They are independant of each other and have different settings and characters. The common theme between the four novellas is the Amish celebration of "Second Christmas" (the day after Christmas). “When Christmas Comes Again” by Beth Wiseman Katherine Zook is facing the first Christmas after the recent death of her husband. When a mysterious Englischer leaves a package of photographs of her family, she sets out to discover who he is. He guides her in helping her children with their grief, but how can she get to the truth when his story keeps changing? I don't know what genre "When Christmas Comes Again" would be considered. It isn't primarily a romance although there is a small amount of courting. It also has a bit of a mystery in it as Katherine sorts out the truth to the Englischer's story. I enjoyed reading "When Christmas Comes Again" and found the portrayal of the different ways people grieve to be believable. James made me laugh and I was happy to see that the Zooks worked out the ending of the story in a positive way. It's been a year since Joy Stolzfus' parents died and ever since, Joy has thrown herself into the family bakery, the only thing she has left of them. Her beau doesn't understand her commitment to the bakery and instead of the proposal she expects, says he wants to see other people. Joy pours out her heart to her cousin and mails the letter along with a package of baked goods. The package gets sent to a cabinetmaker instead and he writes back. They soon develop a friendship through letters. When Noah Esh starts making regular purchases at the bakery on his way to a job, he and Joy develop a friendship and Joy finds herself confused as to who she cares about; Henry, Noah, or the cabinetmaker. I really liked "Her Christmas Pen Pal". I think it was my favorite story in the book. I liked Joy and her drive and love for the bakery. She was the perfect mix of push over and determination. I could feel her pain over Henry and her confusion over how she felt for Noah and the cabinetmaker. I was really pulling for Joy and Noah to get together. I stayed up WAY too late reading this story. Anne Marie Smucker has been best friends with Nathaniel Mast since they were kids. She hasn't ever thought of him in a romantic way even though everyone around them keeps hinting that they are more than friends. Why is it when she is suddenly going to be moving out of the area that all she can think about is Nathaniel? "A Gift for Anne Marie" was my 2nd favorite story in the book. I really liked Anne Marie and Nathaniel and their easy relationship. I figured that they were going to have their happily ever after, but there were times in the story that I cried along with Anne Marie and wanted to be there for her to talk to. Esther Glick has always been in the shadow of her more outgoing twin, Violet. Now she is serving as a nanny for her cousin's newborn son and her mother sent her the secret recipe for her Vanilla Crumb Pie. She doesn't realize the silent auction isn't just for the pie. When Ammon Schwartz buys her pie and then seems interested in her, will she finally find the reason to stop hiding her heart? I could relate to Esther and her shyness and not feeling "good enough". I liked watching her find her worth comes from God and not those around her. There are "Reading Group Questions" at the end of each story as well as recipes from each story. The stories are all quick reads which makes it nice when you don't have a lot of time but still like to read a good Christian romance. I received a free eBook version of this book in exchange for my honest review through booklookbloggers. For Christmas, we gave Emily a painting set. She wanted to paint with it right away, but we had our extended family Christmas party to go to. She brought it out today and painted a picture for her siblings. It even came with this cute little paint palette made for lefties! Emily has always been my child who was most interested in creating masterpieces. 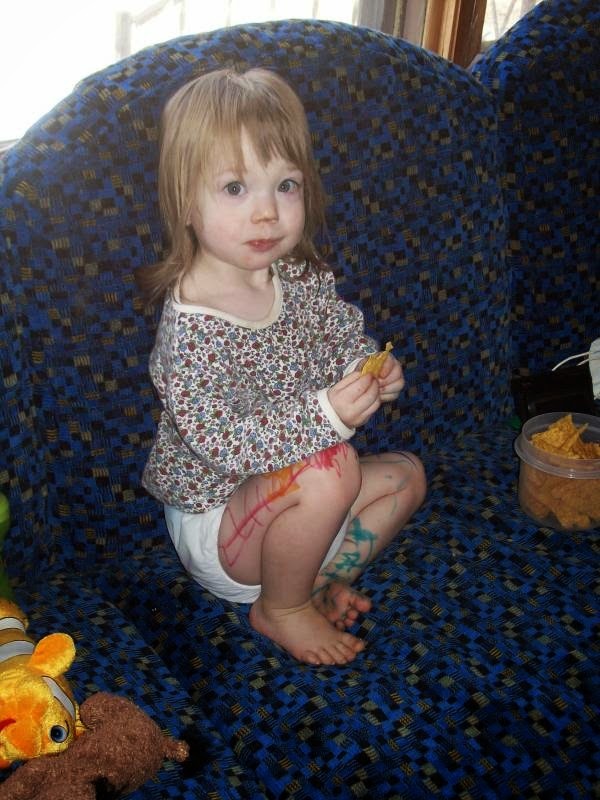 This picture is of Emily the day before her 2nd birthday. I wrote an identically titled blog post about it here. I'm not that into making resolutions when a new year starts, but I do have some goals that I'd like to accomplish this year.